I won’t lie and say this potato salad is quick to make (because I’m a slow potato peeler/ veggie slicer), but it’s worth it. You can eat a lot of it, guilt free! Put potatoes in a pot and fill with water until poatoes are covered. Bring to a boil and cook until a fork passes through potatoes but they’re still firm. Drain and let potatoes cool, then peel. Cut potatoes into ½ inch cubes. In a large bowl, combine all ingredients, stirring well. Serve at room temperature or chilled. Jenny Craig: Since this is more of a side dish, you’ll want to add 2 Meat servings for lunch or dinner. Weight Watchers: 5 Points (using calculatorcat.com). Here’s the thing about this volumized potato salad: it doesn’t stay more than a day or two. I feel like that’s important to note. There are a lot of veggies, and the water from them (probably most specifically the cucumber) will gather at the bottom of the bowl after the salad has been sitting more than 24 hours. So I wouldn’t make this way ahead of time. However, if you’re like me, and you like potato salad, and you like a lot of potato salad, use this recipe. It tastes great, and it’s good for you. 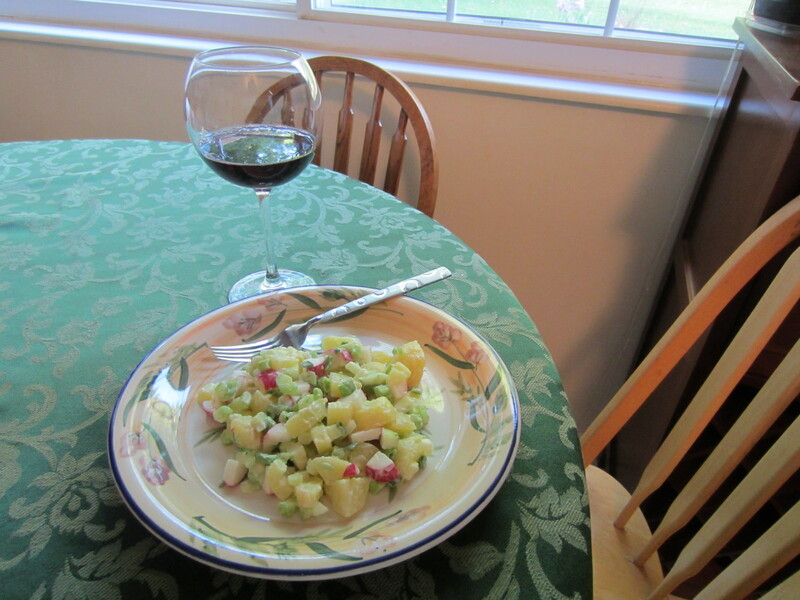 I started with my mom’s potato salad recipe and volumized it, adding veggies and cutting back on the mayo. She really stressed the importance of using “new” red potatoes. 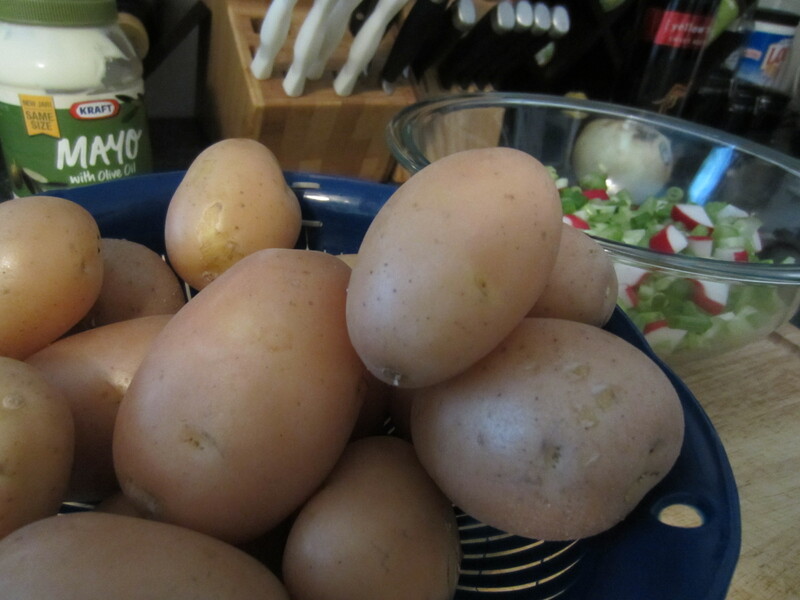 I spent a while peeling the potatoes after they were boiled (as opposed to beforehand). I found it to be a sticky mess. Yeah, the skins come off a bit easier, but they also get stuck in your potato peeler. I guess this is a matter of preference. Personally, the next time I make this, I’m leaving the skins on. I like red potato skins, and that’s where most of the nutrients are anyway. If you’ve read through the ingredients, you’re probably thinking, “Radishes? Really?” Thomas loves them, so I figured I’d give this a try, and they really surprised me. They gave the salad a great, peppery kick. And they added a little crunch. If you can think of other vegetables to add to this, let me know below!